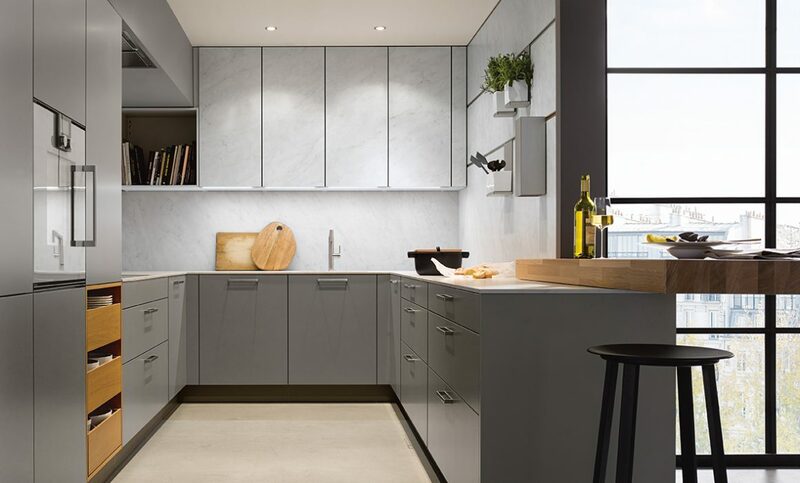 There are five basic layouts that your designer will consider for your kitchen re-design. 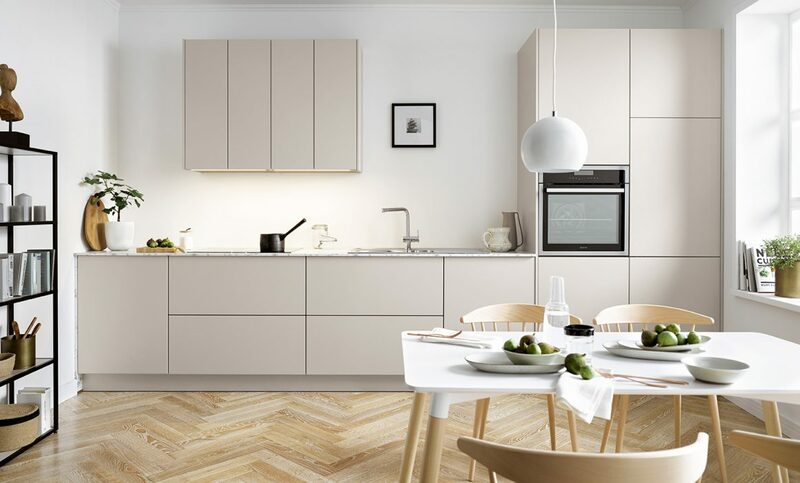 They will advise on the best option for the space available but discussions are also needed to ensure the kitchen functions in the best way for you, and how you’d like to use the space. Choosing the right furniture arrangement is the first big decision to be made in the re-design process. 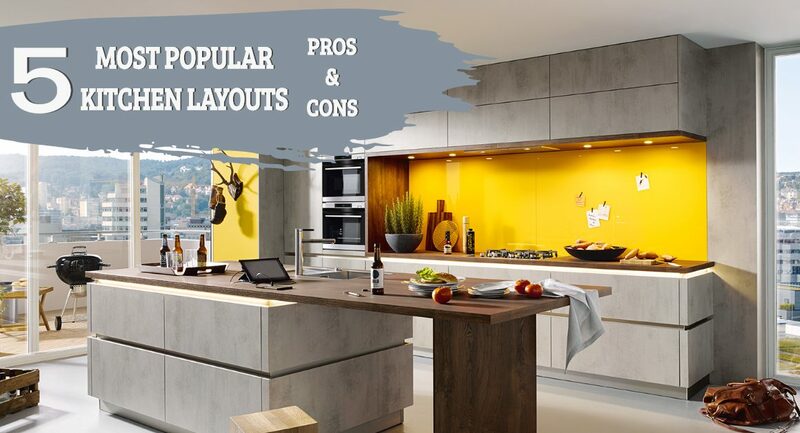 To give you some ideas of the layouts available, we’ve put together this blog showcasing the five most popular kitchen layouts along with a visual and the pros and cons of each one. The one-wall kitchen has everything you need stretched out along one wall. It usually consists of a bank of tall units to give optimum storage and built in appliances. It works well in a long narrow room but, if space allows, an island or large table can be added to give more storage and preparation space. Great for saving space, especially in small apartments or open plan houses. Provides a clean, minimal look with everything neatly in a row. Can easily add a table or an island for added storage. Depending on the size of the space, a one-wall may not give you enough space for more than one person to prepare food, wash dishes or socialise. Not as popular without the added island for more worktop space. A galley kitchen consists of two parallel walls full of units, with a walkway in between. Usually seen in terraced houses, it’s the best use of space for a small, narrow kitchen. It’s not generally a kitchen you choose if you have a large space but one that’s required and works well for a tight space. Can make great use of space, with easy access to plenty of worktops and storage. Don’t have any awkward corners. Can be a tight squeeze if the walkway is narrow. Not great for multiple cooks or socialising. Can have a limited amount of natural light. 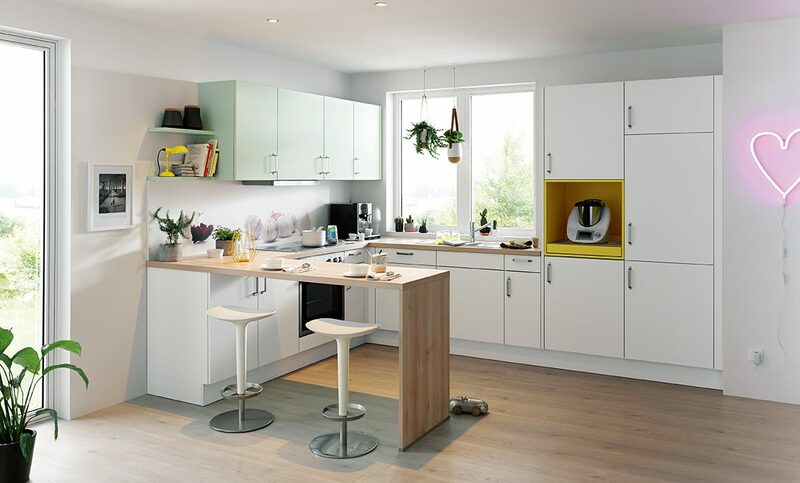 This layout has two long and one short wall of cabinets and worktop to form a U-Shape. There’s the option of all the units being up against the walls or one of the runs of units can create a division between the kitchen and dining areas (see peninsula kitchen.) An island can be added if the room is large enough, giving even more storage to this layout. There’s plenty of space for food preparation and multiple cooks. 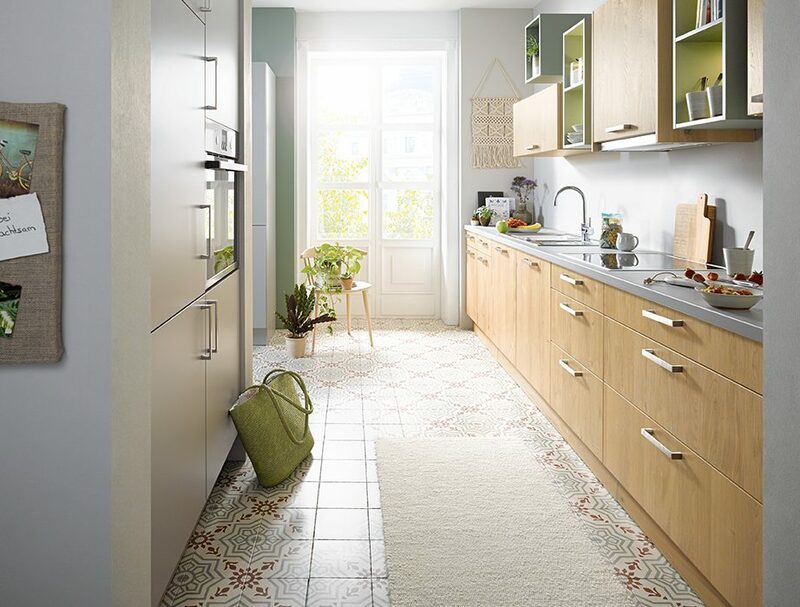 It gives a lot of storage even in a smaller kitchen, with no island. Suits kitchen-diner style rooms well. In small homes with limited floor space, this layout can feel a little cramped. This layout has two corners which can be awkward or will require two corner storage solutions. This layout uses two of the walls forming an L-Shape and if there’s space it can be combined with an island unit. This is a popular choice as it gives plenty of storage with an open aspect to the rest of the room. Ideal for cooking and entertaining with plenty of room for guests and chefs to mingle. Appliances can be spread out across the 2 walls (and island) providing multiple work zones. A longer L can eliminate the need for an island altogether and keep high-traffic areas open. Needs careful planning so that if the appliances are spread out across the space they still work well for the cook. More work areas to clean. A peninsula kitchen has a unit similar to an island but attached to the rest of the units at one end, often called a breakfast bar. The peninsula is often an extended run of units or just a worktop to create a bar for some seating on a U-Shaped or L-Shaped kitchen. Unlike a true island, it can accommodate more appliances or seating in a longer space. Great for kitchens that are too narrow for an island. Can be used to separate the kitchen area from the dining. Typically leads to only one entry-point into and out of the space. It’s good to have an idea of your preferred layout and then take time with your designer to get the arrangement right. A good designer will be able to advise you on whether you have enough space for an island and then whether it would work best with a U-Shaped, L-Shaped or One-Wall kitchen. 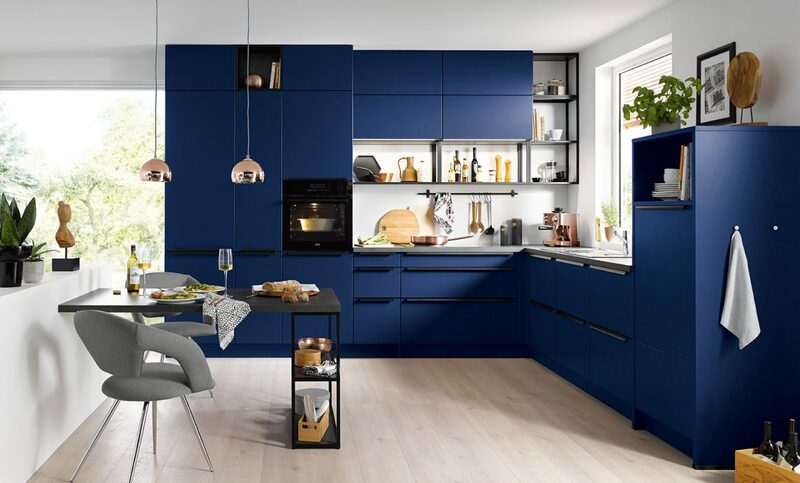 If you’d like us to plan your dream kitchen, you can Book a Free Showroom Design Consultation online which will secure some one-to-one time with one of our experienced kitchen designers.